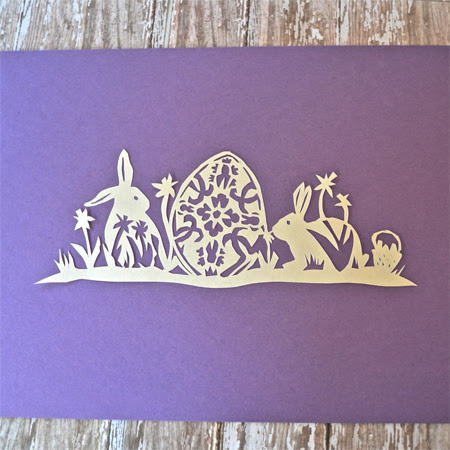 Looking for more Easter decor to put up around the house, I decided to design another paper cut for the season. You might remember that I designed this paper cut for Valentine's. I've mentioned before that I'm definitely an amateur when it comes to the art of paper cutting, but I still enjoy it. The bunny design I put together has a couple of flaws, but I still like the way it turned out. The above shows my cutting process. 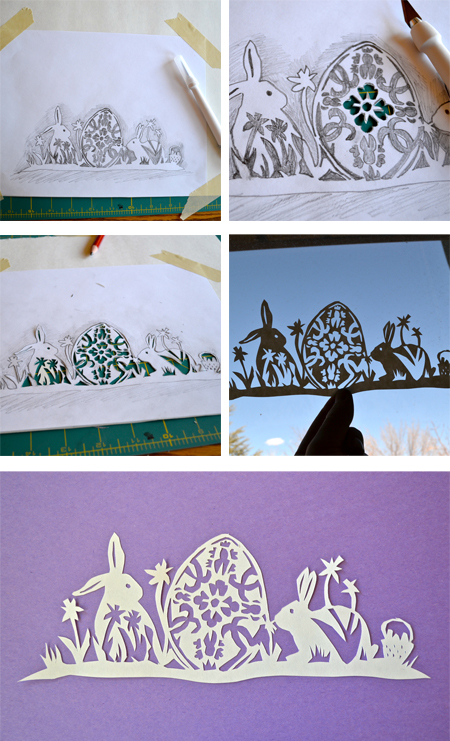 There are more detailed photos of the process on my Valentine's paper cut post. The pattern needs a little tweaking and I modified it a little as I went along, but I still thought I'd provide my sketch in case you'd like to try it out yourself. Easter is coming up so quickly and I feel very unprepared. Jellybean's birthday is in a week and I keep forgetting that I need to get our Easter plans figured out for just another week after that. Then, of course, there's the whole birth of our third child looming. I still have about 6 weeks to go. I told D today that I need a baby-cation. I'm thinking that involves me, a hotel room, room service, movies and some serious alone time. I doubt that's possible, but it's nice to dream about.